In past posts on this blog, one by one, I’ve pointed out a host of new opportunities that are emerging in local media markets. In this post, I’m going to roll them up into a single new business entity we can visualize and work to develop. Metaphorically, you could say we used to dominate our markets with a burger-and-fries kind of business. The burger was the media channel we owned — the space in the newspaper or the air time on our TV channel or radio station. We sold the burger to almost all of our accounts. And we also tried to sell them some fries on the side — such as banner ads on our websites and other ancillary products and services. But really, it was all about the burger. Today, our audiences are consuming vastly more kinds of media than ever before. They still like burgers, but they’re all over the Web consuming offerings we didn’t create and probably can’t. To reach their target audiences, the businesses in our markets need more than just our burgers and fries. And, as I wrote in my last post, we’re living in a direct-access world now, where businesses need to deploy a wide range of solutions to speak directly to the consumer. So, in the traditional media, we have a choice: We can stay focused on selling ever-shrinking orders of burgers and fries, or we can radically expand our offerings to become a one-stop marketing provider for local businesses. In the bewildering profusion of digital and non-digital marketing techniques now available, each local business needs a coherent plan. Few have the time or savvy to work this out for themselves, so there’s a need for someone who understands the business and the market, and who knows how to deploy and coordinate the right solutions to reach the right potential customers. That’s what I’m calling the “local marketing agency” model. 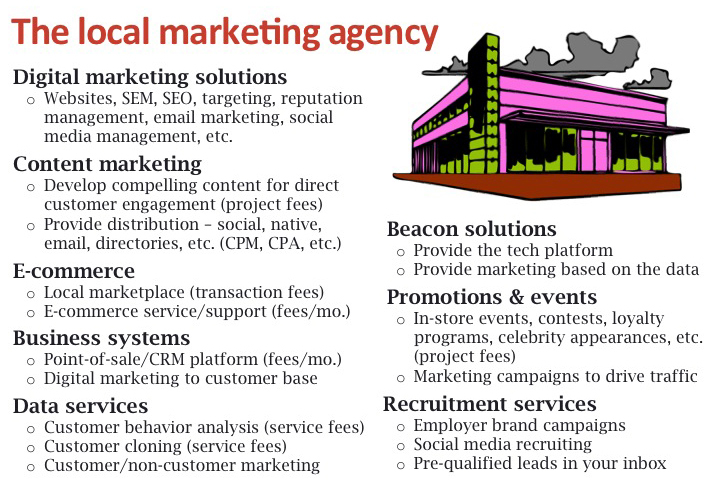 The graphic at right depicts this as a single store able to deliver a wide range of local marketing services. It’s not a newspaper or a radio or TV station — it’s a group of sales people who understand a wide range of solutions, backed up by a set of fulfillment people to carry out the programs they sell. I’ve written about most of these solutions before, so I won’t go into depth on them here. However, I’ll link to the posts where I’ve described them in more detail. Digital marketing solutions. These are the basic building blocks of a competent marketing and advertising program for any local business. More and more traditional media companies are now offering this cluster of services, often calling it a “digital agency” approach. Here and here, I wrote about this, and about how we went after it at Morris — although our model has changed a lot since then. Content marketing. A huge opportunity, covered here. In a direct-access world, a business can present its own case directly to consumers, using all kinds of media. But to do that, it needs to develop high-quality content and figure out how to get it in front of its most likely potential customers. It needs help with both of these tasks. E-commerce. Amazon and the big-box stores are selling huge amounts of inventory online, leaving local retailers in the dust. As I described here, we’re in a great position to help them get into the game. Business systems. A new wave of in-store point-of-sale systems is coming — systems that will capture customer data and make it usable for post-sale marketing. As I wrote here, we could be the ones to offer them — and to supply the marketing expertise needed to capitalize on the data. Data services. Everybody talks about Big Data, but who helps local businesses figure out how to use it to increase their sales? We could be the ones, as I wrote here. Beacon solutions. I haven’t written about this new solution yet, as it still seems early in the development of powerful ways to use them for customer behavior tracking and customer communications. But as those become clearer, beacon services would be a natural fit among the solutions offered by a local marketing agency. Promotions and events. As I wrote here, in-store traffic is declining fast, and we could be the ones to help local businesses figure out how to buck the trend with custom promotions and events in their stores. Recruitment services. Job listings are only the most basic need of an employer who’s trying to fill jobs. As I wrote here, employers want and need more sophisticated help, and a local marketing agency could provide it. As this list shows, there’s no shortage of marketing sales opportunities in local markets. Lots of businesses have lots of needs we’re not meeting today. No media company would want to tackle them all at once. Each one requires learning a whole new kind of business. But at Morris, we’re at various stages of progress on four of the eight. A huge question in each case is, should this be part of the core sales effort, or should it be separate? With most of these opportunities, it would be foolish to think that the people currently selling our burgers and fries can take them on. In fact, they haven’t done all that well selling fries so far. In these new areas, there’s too much to learn, the technologies are too far removed from standard advertising solutions. And we wouldn’t want to distract our current sales people from selling the burgers and fries. That’s why I think we need to picture something like the graphic above — a separate, stand-alone agency under different leadership, with different skill sets and technologies. Not necessarily in another building, although that would probably help. However, we would probably want to keep the agency under the umbrella of our well-known local brand, to provide credibility. Within that agency, the best structure would be much like a traditional ad agency. That is, having account reps on the street (or on the phone) with good knowledge of the solutions we’re offering, backed up at the office by subject-matter experts on each of the solutions. That way, the experts can help the reps fashion the right program for each business. And the agency could help the core sales reps present these new solutions to advertisers who are buying burgers and fries. Many media markets probably are too small for that structure. But in the first opportunity on the list above — digital marketing solutions — vendors have emerged to provide turnkey back-end services to support small-market local sales reps. Some of those vendors already offer e-commerce and content marketing. If local media companies start selling other solutions on the list, maybe they will diversify to support those, too. The bottom line is, once you take off the blinders of our old burgers-and-fries business, it’s clear that the businesses in our markets need and want lots of other kinds of solutions. They will buy them from someone — why not us? Posted on September 14, 2015, in Advertising, content marketing, Digital media sales, direct access, Disruption, e-commerce, innovation, management, marketing agency, Media business model, media management, Native advertising, Revenue, Sales. Bookmark the permalink. 4 Comments.